People were bringing little children to Jesus to have him touch them, but the disciples scolded them. When Jesus saw this, he was indignant. He said to them, "Let the little children come to me, and do not hinder them, for the kingdom of God belongs to such as these. I tell you the truth, anyone who will not receive the kingdom of God like a little child will never enter it." And he took the children in his arms, put his hands on them, and blessed them. When we are in a state of innocence, we do not take credit for anything good, but ascribe and attribute everything to the Lord. We want to be led by the Lord and not by ourselves. We love everything that is good, and delight in everything that is true because we know and perceive that loving what is good--which means intending and doing good--is loving the Lord, and loving what is true is loving our neighbor. Further, we live content with what we have, whether it is little or much, because we know that we receive as much as is useful--little if little is good for us, and much if much is good for us. We do not know what is best for ourselves; only the Lord knows. And in the Lord's sight, everything given is eternal. This year, I'm getting a jump on children's Sunday and giving you a sermon on children a bit early. But it's not really about children. It's about us. In the Gospel story, the children had no problems at all. They were coming to Jesus along with their parents, happy to be in his presence and feel his love. It was the adults--actually, Jesus' own disciples--who were having a problem. We don't know exactly what was going through their minds when they began to turn away the parents who were bringing their children to Jesus. Perhaps they thought Jesus was much too important a man to "waste" his time with mere children. After all, in those days children were mainly valued as future adults who would provide labor in the family business and carry on the family name. Until then, they were a drain on the family resources. In modern day financial language, we might say that children were often seen as an investment in the future, not a current asset. Perhaps the disciples thought that Jesus' time was better spent teaching adults, who could understand what he was saying, and have their lives changed by it. Time spent with children was time not spent with adults who might accept the message. Or perhaps they were simply acting the part of a celebrity's "handlers," trying to keep him from being swamped and exhausted by the people. Whatever their reasons, Jesus was not at all happy when he realized that his disciples were preventing parents from bringing their children to him. This is when he said those famous words--not to the parents, but to the disciples: "Anyone who will not receive the kingdom of God like a little child will never enter it." And then, we are told, "he took the children in his arms, put his hands on them, and blessed them." In the context of his culture, taking the children in his arms and blessing them was not so surprising. It was a custom in those days for mothers to bring their children to a Rabbi on their first birthday so that he would bless them. The more distinguished the Rabbi, the better it was. So these mothers were giving Jesus a compliment by bringing their children to him. And in blessing them, he was accepting the role of a Rabbi--a spiritual leader. Children have not lost their sense of wonder as adults so often have. Children's lives are founded on trust that their needs will be met. Children are naturally obedient, even though they do rebel and disobey, too. Children are very forgiving, and soon forget and move past all sorts of wrongs done to them. 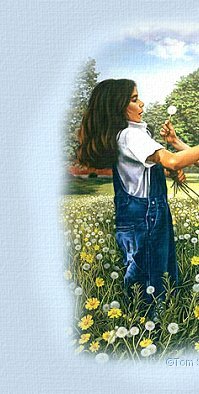 I would suggest that all four of these qualities--a sense of wonder, trust, obedience, and forgiveness--could be brought under one quality that Emanuel Swedenborg offers as the primary characteristic of children, and especially of young children: innocence. Even though children are most often entirely wrapped up in their own feelings and desires in a way that would be considered, well, childish in an adult, we can't help but love them. Why? Because they mean no harm by anything they do. They innocently and spontaneously express what is within, and the quality of simple trust and harmlessness that suffuses everything they say and do gives them an endearing quality that few of us manage to retain into adulthood. As children grow, their early innocence rapidly fades, and though there are still vestiges of it even into the teenage years, parents must find another basis on which to love their older children. The innocence of childhood is extraordinarily difficult to recapture as an adult. In fact, let's be honest: as long as we live on this earth and our minds remain fully functioning, we can never again experience the utter innocence of young children whose parents love and care for them. We have seen too much, and we know too much. We have seen too much of the seamy side of life--of people treating each other badly and not being trustworthy; of people taking advantage of others and doing great damage to them. We know too much of what can happen to people in this world who do not protect themselves from that seamy side of life. We may have had our own innocence taken advantage of; or we may have seen others "taken to the cleaners," so to speak, when they really didn't deserve it. Besides, as adults, we normally do not have parents taking care of all our physical needs--not to mention our emotional needs. As children, unless we had neglectful or abusive parents, or some other social or family situation that caused us not to be taken care of properly, we simply assumed that there would be food on the table, clothes on our bodies, and a roof over our heads. These were givens. And even if we were neglected, what sustenance we did get generally came from others, and not from our own efforts--especially when we were very young. For adults, these things aren't true anymore. It can be a rude awakening when our schooling is finished and we realize that if we don't get a job and make some money, we won't have a place to stay, food to eat, or clothes to wear. Going back to our parents' place is an option, but it is generally at the cost of not being able to feel like full, independent adults. What we look for as young adults is not innocence--not trusting others to provide for our wants and needs and make decisions for us--but independence: the ability to take care of ourselves and decide for ourselves what we will do from minute to minute, day to day, week to week, and year to year. As older children, teenagers, and young adults, we work hard at being able to take care of ourselves and run our own lives. And we have no intention of going back to being dependent on someone else. Perhaps this is why we have a whole lifetime to become childlike again. Perhaps this is why it is only in our elder years, when we either no longer need to work to support ourselves and our families or are no longer able to work, that we can enter our "second childhood." Perhaps it takes us a whole adult life full of being self-sufficient in order to realize that we humans are not meant to be self-sufficient. When we come to that realization, we begin once again to acquire in ourselves the quality of innocence that has been largely missing from our lives ever since early childhood. It is often in our final years on this earth that we once again develop a sense of wonder, trust, obedience (to whom? ), forgiveness, and the other qualities of innocence. In its more common definitions, innocence involves two qualities. One is harmlessness: the inability or unwillingness to hurt or do evil to anyone or anything. And if we are unable or unwilling to do harm, then except when we make a mistake or lack proper understanding of a situation, we in fact do no harm to anyone or anything. This is the kind of innocence that the courts deal with, and it is in contrast to guilt, which involves a willingness and even a desire to harm another person, which is carried out in action when there is an opportunity to do so. The other quality associated with innocence, though it is not as often clearly identified, is a willingness to be led by others rather than insisting on following our own judgment. In our culture, which does not put a high value on this aspect of innocence, it is often labeled inexperience or naiveté. Only emotional weaklings and people who don't know better would allow themselves to be led around by others like sheep. Yes, that is okay for little children, but mature adults should run their own lives, and not be at someone else's beck and call! So how can a self-respecting adult in our society ever heed Jesus' words and become like a child again, after putting out years and years of effort to become a self-responsible, self-directing adult? It flies in the face of all our instincts. And that is exactly the problem. After childhood, our instincts are all in the direction of becoming the master of our own fate, the ruler of our own lives. Dependence on others for any of our basic needs makes us vulnerable--and our instincts tell us that we should be strong and self-reliant, not trusting anything important to someone other than ourselves. After all, if we trust someone else to take care of one of our fundamental needs, what if they don't follow through? It's better to take care of it ourselves, and be sure that it will get done. Unfortunately, if we stick to those instincts, we find ourselves becoming more and more isolated from everyone around us. If we are not able to open up in trust to others, but keep all our most sensitive wants and needs to ourselves, our world becomes smaller and smaller, until even those we should feel the closest to--our best friends and closest family members--begin to feel emotionally distant. The price for self-sufficiency is a lack of relationship. And we humans, for all our instincts toward self-reliance, have an even deeper need: the need for relationship and community with other human beings. It is this need that gradually brings us around, and causes us to move back toward the innocence of children. Children live in a web of relationships that are essential to their physical and emotional wellbeing. Separated from parents and family, and later from friends and mentors, they soon wither and die emotionally and even physically. Even as adults, it is a fiction that we are in any way self-sufficient. We work for other people and are paid and supported by other people in a vast economic web so complex that thousands of economists can spend their lifetimes studying it, and still not fully understand it. And the emotional web of relationships that we live in is an order of magnitude more complex, so that psychologists and psychiatrists admit that we only understand a tiny fraction of what there is to know about the human mind, and even less about what goes on when human beings relate to each other, either one-on-one or as part of a group. In truth, we are always dependent on others even for our most basic daily needs. But we spend a certain part of our adulthood with the rather illogical feeling that we are "supporting ourselves." Perhaps it is a necessary illusion. Perhaps we would not get up each morning and make our contribution to society if we didn't think that we were supporting ourselves by our efforts. And God has constructed this world so that one way or another, we can find the motivation we need to get out of ourselves and be of service to our fellow human beings. For most of us, it takes a lifetime of "supporting ourselves" before we begin to look beneath the surface and realize that all along, we have been supported by more people than we ever realized. We come to realize just how much we depend upon others only when we look back on those times in our lives when we were reaching the end of our rope, and then someone stepped in to keep us from falling; or when we simply weren't strong enough on our own, and the help that we needed was there for us. This is when we can begin once again to have the innocence of a child. Only now, that innocence has a new quality that children have not yet had time to develop. The innocence of children is not an intentional innocence. Children are innocent because they don't know any better and do not have enough strength or experience to do any real harm. The innocence we develop later in life is not from inexperience or naiveté, but from wisdom. It is the wisdom of knowing that on our own, we are incomplete human beings. It is the innocence of knowing the difference between right and wrong, between good and evil, and consciously choosing what is good and right because we believe that is the best way to follow. And especially, it is the innocence of being willing to relinquish control over our own lives--not to any other human being or any human institution, but to God. We can never go back to the same kind of innocence we had as children, nor would we want to. But we can move forward to the true innocence of a complete trust in the goodness and love of God, and a full and joyous desire do spend our lives doing only what is good and right in order to bring peace and happiness to our fellow human beings. And yes, we do become children once again: we become children of God. Amen.